Emperor Go-Sanjō (後三条天皇, Go-Sanjō-tennō, September 3, 1034 – June 15, 1073) was the 71st emperor of Japan, according to the traditional order of succession. Go-Sanjō's reign spanned the years from 1068 through 1073. This 11th century sovereign was named after Emperor Sanjō and go- (後), translates literally as "later;" and thus, he is sometimes called the "Later Emperor Sanjō", or, in some older sources, may be identified as "Sanjō, the second" or as "Sanjo II." 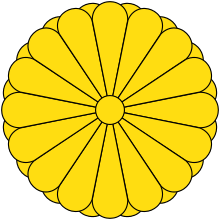 Before his ascension to the Chrysanthemum Throne, his personal name (imina) was Takahito-shinnō (尊仁親王). Takahito-shinnō was the second son of Emperor Go-Suzaku. His mother was Empress (kōgō) Sadako (禎子内親王), the third daughter of Emperor Sanjō, making him the first Emperor in 170 years (since Emperor Uda) whose mother was not of Fujiwara descent paternally. His father and mother were grandchildren of Fujiwara no Michinaga maternally. The Empress mother of the future Emperor Go-Sanjō was also known as Tishi, and a Yōmei-mon In (1012–94). Go-Sanjō had seven Imperial sons and daughters. Because Prince Takahito was not of Fujiwara descent, the Kampaku, Fujiwara no Yorimichi neglected him, but Emperor Go-Suzaku decreed that upon his elder brother Chikahito's enthronement (as Emperor Go-Reizei), that Takahito would become the heir (kōtaitei). As Go-Reizei had no children of his own, upon his death, Takahito became emperor. May 22, 1068 (Jiryaku 4, 19th day of the 4th month): In the 4th year of Emperor Go-Reizei's reign (後冷泉天皇四年), he died at age 44; and the succession (senso) was received by a his son. Shortly thereafter, Emperor Go-Sanjo is said to have acceded to the throne (sokui). Yorimichi's younger brother Norimichi became kampaku, but Go-Sanjō was determined to rule personally. 1069 (Enkyū 1): Go-Sanjō issued the Enkyū Shōen Regulation Decree (Enkyū is the name of the era in which the decree was issued); and the emperor called for the establishment of a government office to certify Shōen records. 1070 (Enkyū 2): Go-Sanjō ordered a preliminary system of laws and a bureaucracy for regulating silk. 1072 (Enkyū 4): As the Ritsuryō system of centralized authority had largely failed by this time, Go-Sanjō became interested in strengthening the finances of the Imperial Household. January 18, 1072 (Enkyū 4, 8th day of the 12th month): In the 6th year of Emperor Go-Sanjō's reign (桓武天皇六年), the emperor abdicated in favor of his son, and the succession (senso) was received by his son. 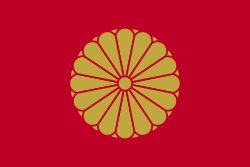 Shortly thereafter, Emperor Shirakawa is said to have acceded to the throne (sokui). May 11, 1073 (Enkyū 5, 21st day of the 4th month): Go-Sanjō entered the Buddhist priesthood; and his new priestly name became Kongō-gyō. June 15, 1073 (Enkyū 5, 7th day of the 5th month): The former-Emperor Go-Sanjō died at the age of 40. Decorative emblems (kiri) of the Hosokawa clan are found at Ryoan-ji. Go-Sanjo is amongst six other emperors entombed near what had been the residence of Hosokawa Katsumoto before the Ōnin War. Go-Sanjō is buried amongst the "Seven Imperial Tombs" at Ryōan-ji in Kyoto. The actual site of Go-Sanjō's grave is known. This emperor is traditionally venerated at a memorial Shinto shrine (misasagi) at Kyoto. The Imperial Household Agency designates this location as Go-Sanjō's mausoleum. It is formally named Yensō-ji no misasagi. The mound which commemorates the Hosokawa Emperor Go-Sanjō is today named Shu-zan. The emperor's burial place would have been quite humble in the period after Go-Sanjō died. These tombs reached their present state as a result of the 19th century restoration of imperial sepulchers (misasagi) which were ordered by Emperor Meiji. The years of Go-Sanjō's reign are more specifically identified by more than one era name or nengō. ↑ Titsingh, Isaac. (1834). Annales des empereurs du Japon, pp. 166–168; Brown, Delmer et al. (1979). 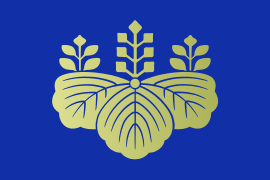 Gukanshō, pp. 314–315; Varley, H. Paul. (1980). Jinnō Shōtōki. p. 198-199. 1 2 3 4 Brown, p. 314. 1 2 3 4 Brown, p. 315. ↑ Titsingh, p. 166; Brown, p. 313; Varley, p. 44; a distinct act of senso is unrecognized prior to Emperor Tenji; and all sovereigns except Jitō, Yōzei, Go-Toba, and Fushimi have senso and sokui in the same year until the reign of Emperor Go-Murakami. ↑ The "Seven Imperial Tombs" at Ryoan-ji are the burial places of Uda, Kazan, Ichijō, Go-Suzaku, Go-Reizei, Go-Sanjō, and Horikawa. ↑ Titsingh, p. 165-168; Brown, p. 313-315.